Now that my station has grown, I have quite a bit of equipment that requires 12-14Vdc of power. In the past couple of years I decided to start using Anderson Power Poles. I decided to use them as it’s starting to be the standard of some organizations and It’s easy. My only complaint that I would have is that sometimes the connectors can loosen up and doesn’t require much force for them to come apart. At this point I have a very minimal setup that needs to be expanded. I have a pigtail off the power supply and set of power poles on each device. If I wanted to use one device, I would have to disconnect power from one device and put it on another. The obvious solution to my problem is the use a distribution panel. There are some commercially made panels that use Anderson power poles but being the cheap ham that I am, I figured I can find a cheaper way. While at a local hamfest this past weekend, One of the vendors had a bunch of products that use the Anderson Power pole. Two of those products has caught my interest. One of the was the “EZ-Gate” by ham source and the other was distribution block by Quiksilver. 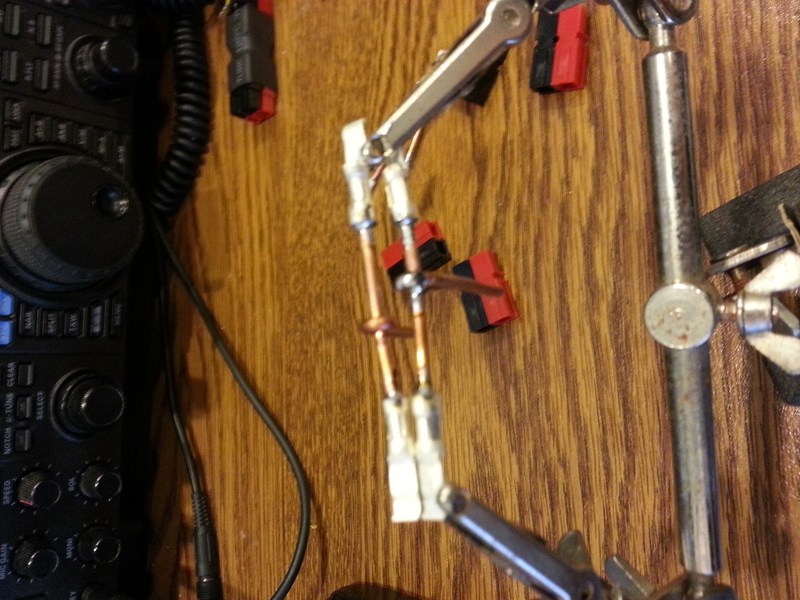 The EZ-Gate is similar to the PWR-Gate by West Mountain Radio but doesn’t have LEDs or Fuses. The EZ-gate is half the cost of the PWR gate and this would allow my station to instantly switch to battery backup during events like field day or when the power goes out in my house. The power distribution block was just a simple 4-way connection using power poles and priced at $20. 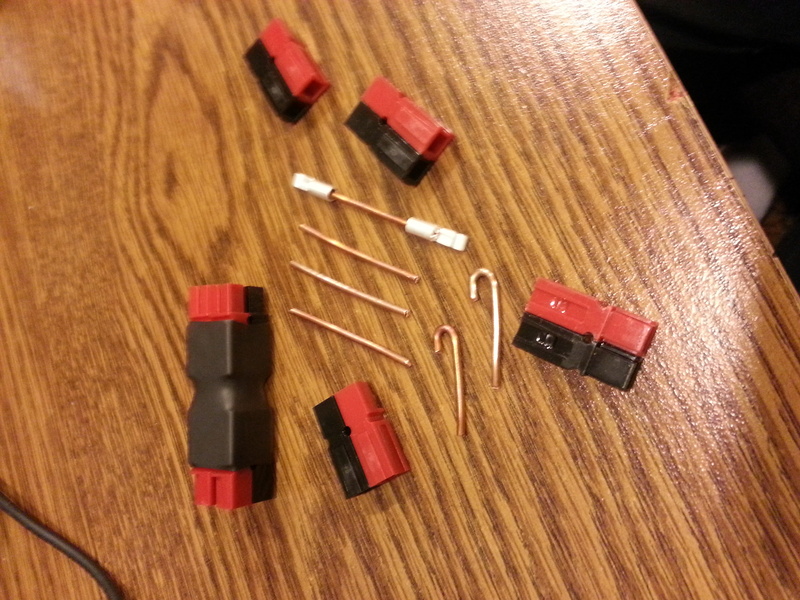 I thought the price was fair but I thought would be cheaper and fun to make my own at home, For the price of one block, I decided to get twenty pairs of power pole connectors. Having no clue how the little distribution blocks were made, I thought of way that I think it was done with the commercially available ones. I used 12ga soild copper wire to connect everything together. Here is a photo of what I started with and the final product. I cut 4 wires about 1.5″ long and placed the connectors on each end and did a quick assembly to check the gap between the sets. I wanted the gap to be short as possible so the entire block would remain rigid. I also cut and bent two additional wires to act as a “link” to the top and bottom sets. 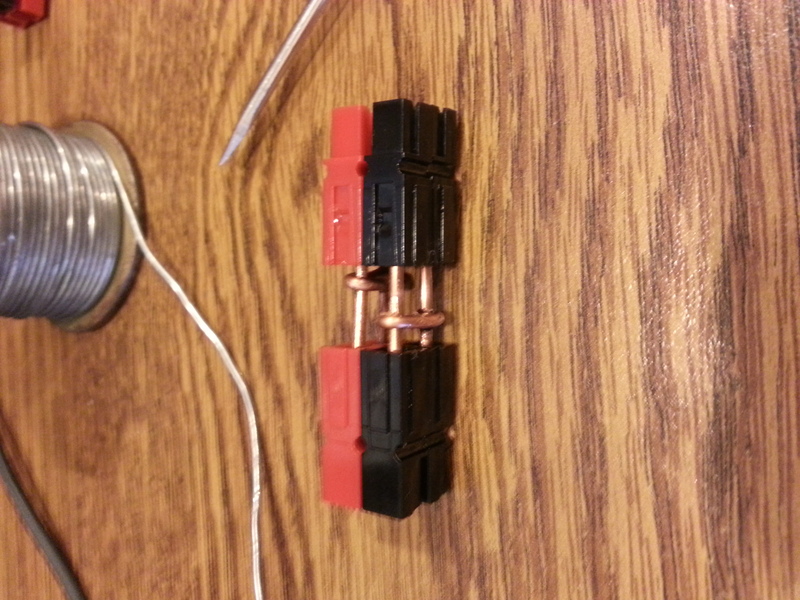 Here is one of the wires that I crimped the ends on. After crimping I soldered each end to make sure of a good connection. Please note that the connectors on each wire are opposite angles from the other side. At this point I installed the wire and marked the location where the link will go with a sharpie. 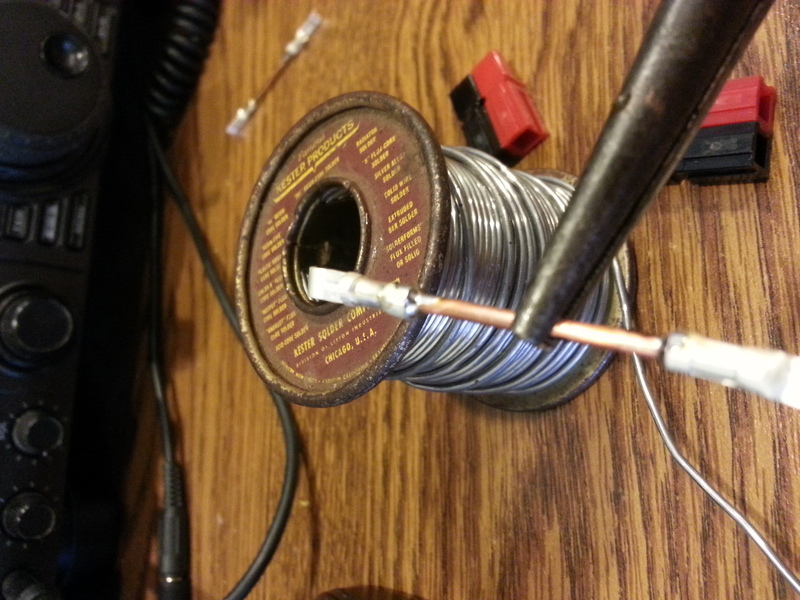 Two of the four wires, I soldered one “link” favoring one side of the wire. Here it is halfway assembled. you will notice the link on the positive side very close to the connector. When the other side will be installed, the other link will be close to the negative block on the opposite side. Before connecting the other side, I used a pair of pliers and curved the links around the top stack of the link. 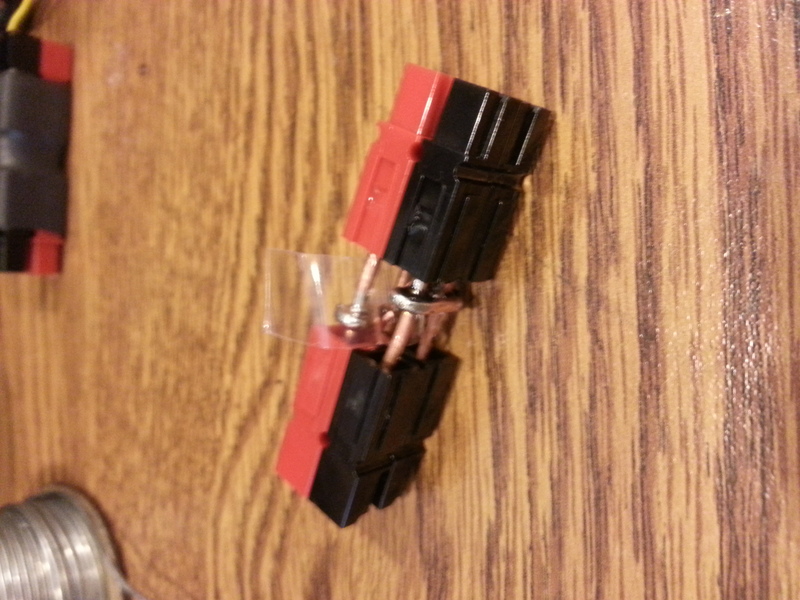 After completely soldering the links and installing the other end, I wrapped the positive side in plastic. 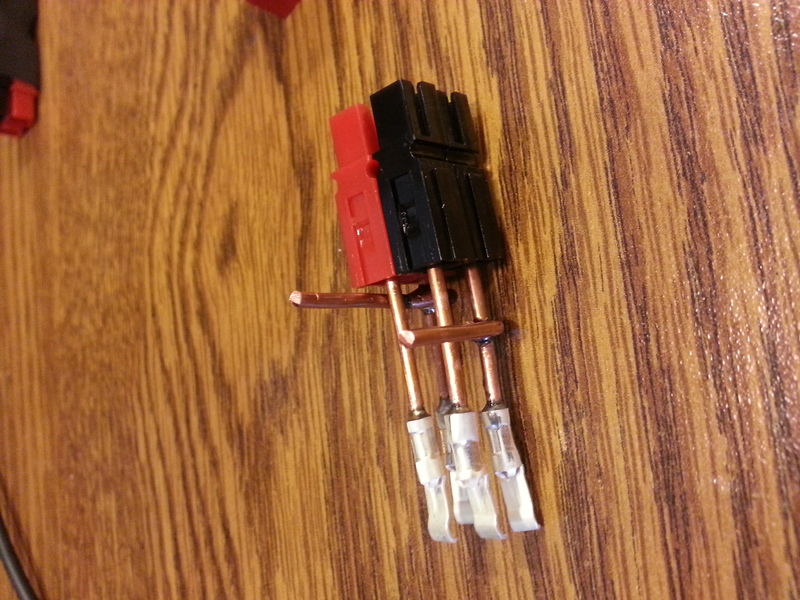 If I were to do this again, I would solder, install heat shrink tubing both leads and then install the other set of connectors. For what I would have paid for ONE commercially produced block, I’ve made two blocks and had and also have an extra set to make a patch cable or pigtails/adapters. It’s no rig runner but it works and does what I need it to do. Great article and tip. Just what I needed. Thank you!